last update: 9/29/2015 come back and check on updates. Ongoing project. This is my second reading of HDNJ and chose Taoist Master Ni Hua-Ching’s son Maoshing Ni’s PHD translation of this classic. This book is a must for serious students of TCM and also Taijiquan. The book can be found here. Chapter 1: Universal Truth. This chapter discusses the importance of protecting ones jing/essence, as you are only born with so much and once you deplete your essence, you will so begin to age quickly. We live in a society where we indulge in our passions and destroy this essence base. Jing/essence in women has a 7 year cycle and men it is 8 years. By the age of 35 in women and 40 in men, our jing/essence will decline rapidly. There are methods of preserving essence and it is based on diet, proper exercise that does not exhaust body, lifestyle of not overindulgence, and calm mindfulness as to not get caught up in negative emotions. The chapter ends with the 4 types of people who have successfully extended their life force via discipline of preserving their jing/essence: the immortals, the “achieved ones”, the sages, and the naturalists. Chapter 2: The Four Seasons. This is the chapter that outlines how to live in harmony with the changing seasons. If you do not go with the flow of the changing seasons, various illnesses can occur. This chapter sets a guideline of what to do and how to deal with the various attributes a season will produce. Chapter 3: Union of Heaven and Man. This is a very important chapter on the discussion of Yang Qi and how it protects the body and life force. 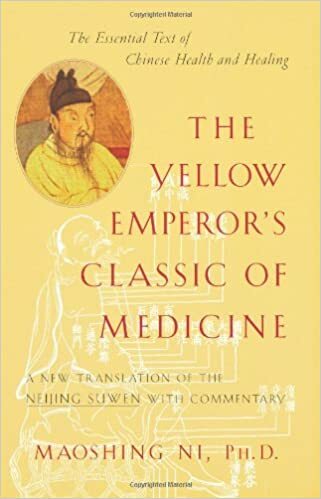 It discusses various health issues when the Yang Qi is weak and external pathogenic forces(wind, cold, heat, damp, fire, dryness) get inside the body and reek chaos. -Excess sweating in summer: causes irritability, “heat attacking exterior”. -Summer heat interior: mind/spirit delerium, fever. Open the pores to release the heat. -Damp invasion- head heavy, large muscles and tendons contract, spasm, atrophy. -Qi deficiency- swollen limbs, impaired movement, exhausted yang qi. -Anger and Impulsive desires: Yang qi disperses, qi outpours, body is vulnerable to invasion. -Overworked/over stressed: Yang qi will overheat and deplete jing/essence and body fluids/yin depletion, dehydration. -Jian Jue: consumed yin fluids. -Bo Jue: w/anger, energy flows recklessly, damaging qi and blood. -Pian Ku: one side of body sweating, indication of hemiplegia. -Zuo Fe: pores open, damp invasion, rashes, dermatitis. -Ding chaung: overindulgence in rich and greasy foods- lesions with pus. -Zha: red spots on nose from heavy exertion and sweating, allows wind cold invasion. -Zuo chang- wind-cold invasion over a long period of time, causes rectal ulcerations and boils. Pathogenic cold enters and damages yang qi, tendons loose nourishment and body becomes stiff and movement painful. -Lou- Pathogenic cold reaches blood level (very deep) can cause scrofula of the neck. -if pathogenic cold reaches muscle level- lesions and wounds will not heal properly. -if cold invades the Shu points- will cause fear, fright, and nightmares. -Yong zhong: ying qi blocked by pathogenic cold, muscles blocked: cysts and pus conditions. -Feng Nu: weak and sweating_> wind-cold gets into pores causing fluid build-up in the muscles “wind malaria” alternating chills/fever, headache and irritability. – Pathogenic wind as “Root of all evil” when wind gets inside, yang qi gets stuck, wind moves around up/down, left/right and must be purged with herbs and sedated with acupuncture, other wise “wind stroke” or death can occur. wind leads to heat. -Spring: wind causes spleen digestive issues. -Summer: heat malarial issues chills/fever. -Autumn: dampness, lung and cough, cold limbs (Wei jue). -Winter: cold…febrile diseases in spring. Spring: wind affects Liver, head and nosebleeds: needle GB on the neck. Summer: wind affect heart: chest and rib acupuncture. Autumn- wind affects Lungs: acupuncture on shoulders and upper back. Winter: wind affects kidneys/bi-syndrome: acupuncture lower back. Late summer: wind affects spleen: middle back points. Chapter 5 Yin and Yang manifestations in the macrocosm and microcosm: summary of this chapter is in the 5 elements creation, destructive, retraining, cycles. This chapter discusses some of the Outer and Inner layers of Yin and yang in the body. Tai yang- major yang, Zhiyin (BL67) lowest point, Jingming (BL1) highest point. (Tai Yang is the yang within Yin). Yang Ming- Bright yang- distal point Lidui (ST45). (Yang ming is the yang within Yin). Chapter 7: Further discourses on yin and yang. Importance of the 12 movements throughout the year. See diagram. These equal a total of 25 pulses. Both: should be in harmony. Heart- sovereign over all organs, represents consciousness, wisdom, intelligence, spiritual transformation. Lung- advisor who regulates body qi. Liver is a general courageous and smart. Kidney: Stores vitality and will. Triple burner: transports water and fluids. Chapter 9: Energetic cycles of the Universe and their effects on Human beings. 6×60 day cycles, 365 days. Rule o 9. 24 stems through the seasons. 10 stems, 12 earthly branches. Jie qi phases. Those who understand this, master the processes of the universe. Yin/yang process of birth, growth, maturation, and death. Weather: how it affects humans, seasons, and seasons within seasons. 5 elements creation/destruction cycles. 5 zhang- qi that produces jin ye (body fluids both light and heavy. Jin ye= lubricate, fortify body, marrow, jing/essence, shen/spirit. Heart- blood vessels (blood) shen. Lungs- skin and hair (Qi) Po. Kidneys- jing essence, hair of face and head, bones/marrow/teeth. Zhi- will. Liver- stamina, Hun , nails, tendons and blood. ST, SI, BL, SJ: lips and mouth, flesh and muscles. Warns not to indulge in the 5 flavors which will damage its respective organs. Acupuncture: used to move weiqi at the couli “12 spaces between muscles” and expels pathogens from those openings. Obstructions of the heart: Zhongwen (Ren12). Brain, Marrow, Bones, blood vessels, Gall Bladder, uterus are Fu organs. 5 Zhang each store essence. LU9 Taiyuan is an influential point of the vessels. Stomach is the sea of nutrients six fu organs. Chapter 13- Treatment of Mind and Body. Face reading, pulse, understanding spirit, wines, herbs, and acupuncture. Ancients: were healthy and rarely sick they did not need medicines, but used teas and wines as backups in case they did. Middle ages: people began to lose their ways and had to use teas and wines to cure diseases. Today: wines and herbs are not enough. People need acupuncture, moxa, lifestyle adjustments, diet, exercise. Some poisons have to be used to kill illnesses so compound. The Doctor needs to be sincere, compassionate, and responsible. It is very important to heal the emotions of the patient and be aware of their body symptoms and imbalances. Illnesses are not always from external pathogens. Yang deficiency of the 5 zhang organs- Qi cannot propel water causing edema. Yin overflows and Qi escapes to the exterior. Water metabolism imbalance: Qi flow, remove stagnation, diuresis, exercise, get warm, acupuncture. 2. Pulses: look for spirit and Qi. Diagnosis: pulse as the 4 seasons and 5 elements. 16- Diagnostic importance and discussion of the collapse of channels. Essential diagnostics is based on Heaven,Man, Earth trinity. 1 and 2 Feb/March: Qi starts to rise. 3 and 4 April/May: Qi is in the liver, human qi is moderately full, qi solidifies. 7 and 8 Aug/Sept. : Turning point: Heaven begins to descend, earth qi consolidates. Qi in lungs. 9 and 10 Oct/Nov. : Heaven qi quiescent/Earthly qi full and deepens. Heart. 11 and 12 Dec/jan. Coldness. Heaven Qi dormant, earth is crystallized and solid. Spring: 30 minutes, bleeding ok, use Shu points. Summer: use more Luo connection points, bleeding ok, allow it to stop on own. Autumn: superficial needling, wait until the spirit/complexion of patient changes to remove needles. Winter: deep to bone level, can wiggle and push/pull needle, insert extra needles. -Warnings to not puncture an organ, use a cloth on the front of body or one can die. Know the locations. Heart- one can die in 30 minutes. Area should be quiet for patient. The doctor needs to have Qi and be in tune with patient to avoid accidents. Shao yang|	deafness, joints loose, bones dislocate, eyes stare out, face changes from green to white. Yang Ming|	Facial paralysis, delirium, yellow face, swelling muscles and spasms in limbs then stiff. Shao Yin|	Face becomes black, gums recede, teeth blacken, abdomen distended and stagnant. Tai Yin|	abdominal distention, fullness, shortness of breath, vomiting. Jue yin| feverish, chest pain, dry throat, urination frequent, tongue stiff. Scroll 1 Of Nine needles and 12 source points. The Laws of Heaven. Fine needles that penetrate channels harmonize blood and Qi, currents, and counter-currents, assemble exit and entry points. 9 needles and the priorities of their ways. “Easy to say, difficult to master”. High skill: is of spirit and guest (disease/pathogen) If host is strong, then guest is weak. If guest is strong, then Host is weak. Ordinary technique guards the gates. High level technique: controls the moving power “Qi” or vital force. Moving power at the center of space is quiet, clear, subtle. Wu Wei er wu bu wei: nothing but accomplishes everything, it’s coming cannot be hurried, it’s going cannot be chased. Understand the moving power and its way, to do this you must understand the Tao. Coming and going by understanding the cycles of time, day, and year. The blood pulses are widely distributed to the Shu points. 1. Evil qi is on top, needle needs to let pathogen out. 2. Muddy is in the middle. 3. Clear qi is at the bottom. 5 viscera (Zhang): shu points= 25 points. 6 bowels (Fu): shu points= 36 points. Entrance to other channels- ‘He’ sea. 27 energies: 5 shu points. 365 acupoints- places unhampered by skin, flesh, muscles, and bones. Patients: observe their color, face, eyes, listen, pulses. 5 viscera diseases are like thorns, stains, knots, and obstructions. 1. Thorns can be embedded for a long time, but they can be removed. 2. Stains, although filthy, can be washed away. 3. Knots, tied for a long time, can be untied. 4. Obstructions block for a long time, but can be opened up. The best acupuncturist can take out these chronic diseases. This entry was posted in TCM, Massage and Dietary therapy and tagged yellow emperor classic. Bookmark the permalink.